What’s a “paper wallet”? Doesn’t sound too high tech? Printing secrets on paper doesn’t sound high tech, but it’s one of the most secure storage mediums available. Documents printed on paper hundreds of years ago can be found in perfect reading condition to this day. Since ancient China, paper has been used to print artworks and legal documents and these records have survived wars, invasions, floods and other historic hazards. After the 9/11 terrorist attacks, a passport from one of the terrorists was found intact blocks away from WTC ground zero. No hard drive or other magnetic or electronic storage medium could have survived such an event. Many years ago a tool to make computer data backups on paper was announced. You could now print your data in a format that PaperBack could understand and recover. It is a especially designed program which will allow you to retrieve binary data back from a especially printed format on paper. Backups can be printed, transported, then scanned again and recovered. Other innovative ways were found to encode binary data on printouts. One such method is the Quick Response Code, or QR Code for short. QR codes were developed in Japan for the automotive industry as a replacement for simple bar codes. These compact codes can store up to several kilobytes of data, enough to store any type of cryptocurrency private and public keys. Adding these positive features of paper, it became obvious that backing Bitcoin addresses up on paper was not only logical, but a very practical way to keep wallets safe. Since elliptic curve encryption keys are usually very small (on average 10 times smaller than equivalent-security RSA keys), encoding private and public keys using QR codes became a standard practice in the cryptocurrency community. Today a user will see a QR code and immediately figure out it represents a Bitcoin public key or address. 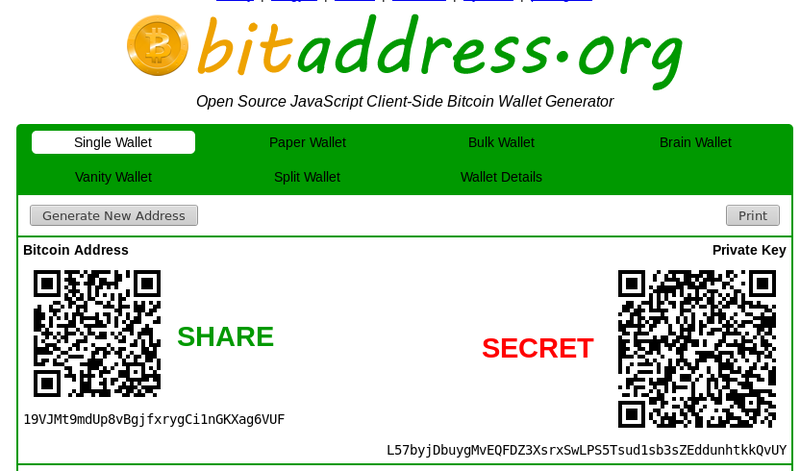 Generating a paper Bitcoin wallet is very simple and secure and there are several methods of doing it. You may use a service like BitcoinPaperWallet.com which obtains random data / entropy from your mouse or keyboard and uses it to generate public and private Bitcoin keys. The private key is saved on a foldable side of piece of paper and the public key / address are printed on the outside of the folded wallet. This way the address can be easily shared when needed, but the private key needed for transactions is securely hidden. This is a throw-away address we generated just for this post. Do not use it as the private key is exposed and this address is now permanently unsafe. Another very interesting and innovative method of generating paper wallets is offered by Mycellium. This cool device looks like a USB flash drive, but inside it is a random Bitcoin address generator. You simply plug it into any USB enabled printer that automatically prints photos from flash drives and the Mycellium device will feed it a paper wallet to be printed. This is a very secure method, assuming your printer is offline and does not store cached documents, because the secret data doesn’t ever pass through your connected PC. Paper wallets printed using Mycellium on a completely disconnected printer are 100% secure unless you allow someone to photograph the printed sheet somehow (security cameras or nearby smartphone yielding friends/coworkers for example). There is one other kind of paper wallet which is the most human friendly of all. Deterministic cryptocurrency wallets can now recreate all your private keys from a set of 10 to 15 English words which you can memorize or print. On wallets which support this feature, such as the Cardano ADA Daedalus wallet, all you need to recover your private and public keys is to enter 12 words into the wallet recovery text field. The wallet’s algorithm is able to recover a seed from these words and then proceed to regenerate all your keys from this seed. This is possible on deterministic wallets because, as the name implies, it always generates the same keys when starting from the same seed. Paper wallets are a great way to keep your coins securely backed up. The main risks of paper wallets are those involved in paper itself: physical destruction, fires and physically losing the wallet or misplacing it. If your printer uses quality / secure ink and your wallet is stored in a safe place, the paper wallet will last hundreds of years without any issues whatsoever.